Q&A transcription: Why are we still using FBS in our processes? Transcription of live webinar Q&A session with our expert speaker. Thank you to everyone who attended the webinar titled ‘Why are we still using FBS in our processes?’ on June 20, 2017. 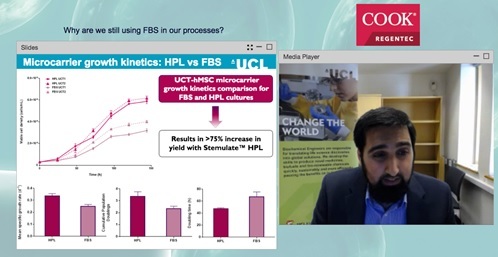 Thank you to our speaker, Dr Qasim Rafiq (University of College London), and our webinar sponsor, Cook Regentec. Below is a transcription of the Q&A session. 1. Human platelet lysate seems safer than fetal bovine serum; can it be used in phase III or IV clinical trials? I believe it can be used for phase III or IV, depending on source and where you obtained it from. I’m not going to highlight a particular vendor because I haven’t looked at all the vendors for human platelet lysate (HPL). However, I would suggest, for those who are interested in looking at HPL for phase III/IV processes, you should identify the opportunities and the major vendors for HPL, and speak to them individually about your needs and concerns. I think that people will be using good manufacturing practice (GMP)-grade HPL and from a commercial and risk management strategy you want to ensure that you can maintain sufficient supply of that GMP-grade HPL. I think in many instances, we have to make pragmatic decisions even if we find a better source elsewhere; if supply can’t be guaranteed then a clear risk associated with limited supply can outweigh the benefits of increased yield. It can certainly be used, but I would also ask is it might be too late by phase III/IV? Depending on your communication with the regulator and where you are in process, you may be locked in to the reagent you utilize, and you probably are locked in by phase III/IV clinical trials. If you are looking at an alternative for fetal bovine serum (FBS), for example if you are considering HPL, then you certainly want to consider that very early on, either in your preclinical studies or very early on in your phase I trial. Beyond phase I it might be very difficult to switch. 2. Has work been done using HPL on other cell types, specifically undifferentiated hES or various differentiated cell types from hES? I know that there are studies which have used HPL on a wide range of cell types and I’m sure a quick PubMed search would highlight them. I can’t guarantee the veracity or the quality of the studies but you would expect to be able to trust the quality of studies in peer reviewed journals and publications. Whether the studies were specifically for undifferentiated human embryonic stem cells (hES) or differentiated cell types from hES, I’m not sure. I would suggest two things: do a very good search of the literature and I’m sure you’ll find some, and do speak to the vendors and see if they have any customers, clients or groups that have used HPL or other cell types. 3. Has work been done without using microcarriers (such as bioreactors for growth of hES without microcarriers)? I haven’t looked extensively into the use of HPL on hES and whether it can be used for aggregate cultures. If there hasn’t been any work done, clearly there is an opportunity for some interesting and novel research in that space. 4. What is the appropriate concentration of HPL to enhance human bone marrow mesenchymal stem cells? What is the fundamental medium mix with HPL (alpha-MEM or DMEM (Dulbecco’s Modified Eagle’s Medium) and why? My colleague, Thomas Heathman, and I have done some studies with umbilical cord mesenchymal stem cells (MSCs) on finding the right concentration of HPL. Although I didn’t really touch on this in my presentation, you would have noticed that we used 10% FBS and 5% HPL. We found that we can drop it even further to below 5% although 5% was our optimum. It was a case of trying to reduce it as low as possible without it impacting significantly on the growth kinetics of the cell. We found that whether it was bone marrow-, adipose- or umbilical tissue-derived, across all three sources, 5% was the optimum level. For those looking at incorporating HPL in their processes, my suggestion would be to test it with your process. 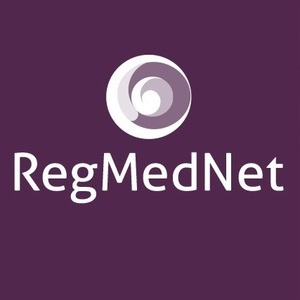 Companies such as Cook Regentec may offer a free sample for you to try. We’ve also looked specifically at DMEM. As I mentioned previously, we tried to compare all our studies to work that we’d done previously. I’m therefore very risk adverse when it comes to changing lots of variables in one go without a managed process because I think it becomes difficult to then try and compare different data sets. It’s also difficult to have an established baseline; even if that baseline isn’t great and is even relatively poor, you’ve got a baseline. Our baseline has always been our FBS-based processes, with our bone marrow and MSCs and we have particular sources that we always use. We’ve now got six or seven donors of bone marrow-derived MSC lines, a couple of donors for adipose cells and a couple of donors for umbilical cells. We’ve tried to establish baseline processes across the board, always using DMEM. For a different project, because of the project needs and different cell donor, in this case, donor-derived MSCs, we are using alpha-MEM and haven’t used HPL in that process at all. For most of our work, we use DMEM and we focus specifically on that, so I can’t comment on how HPL works with alpha-MEM or what the optimal fundamental medium mix is. 5. Have you tested or considered other cell culture media supplements such as chemical defined media or serum media kits? Why or why not? We have used a whole range of different commercially available medias and supplements including chemically-defined media; I am still writing it but we do have a publication coming out and we’ve got some really nice data around our work with serum-free and xeno-free media that we would like to publicize as well. I think we should try and define as much of our process as possible but that may not be possible in all instances and processes. I think that’s one of the major barriers for serum-free xeno cell culture media supplements is that it can be very difficult for certain processes to adapt effectively. However, that’s not been the case with ours; we’ve done some work with bone marrow-derived MSCs and we’ve got some very good data where certain serums, xeno-free media and others have not performed so well and we’ve tried to investigate why. It’s something we have looked at and looked at in detail because there are many alternatives to FBS available. This provides a competitive platform for people to try our multiple products to see what works for them and for them to make a decision rather than be forced into one other alternative. I think that an increased competitive environment within this space shows health and is a positive sign for the industry provides more choice and hopefully will drive down costs. Academic costs are always constrained, so if we can incorporate other products in our processes and eventually move away completely from FBS, we can drag down the cost significantly. 6. Have you tested any GMP-grade HPL products? No, we haven’t, because we haven’t felt the need to. We don’t have a GMP facility within our specific department. Across University College London, we have lots of GMP and clean room space so feasibly we could try it but for our purposes at the moment, it’s not something we have looked at specifically. I’m sure it will be something we will look at over the next few years as we try and take our processes closer to the clinic. In the work that we’ve done, not really. I don’t want to speak too confidently on that point, because I haven’t spoken to my colleague Thomas Heathman about the bone marrow- and the adipose-derived work. Certainly with the umbilical cord tissue, we didn’t experience any noticeable cell death although there will be cell losses at different stages of the process. However, I don’t know if the questioner means when they reach confluency and they start to die as a result of confluency. We reach confluency towards the end of the culture so we haven’t noticed anything like that, although we haven’t specifically looked for that. If you have any further questions, please feel free to email Cook Regentec at customer-service@cookregentec.com or visit www.CookRegentec.com. Why are we still using FBS in our processes?